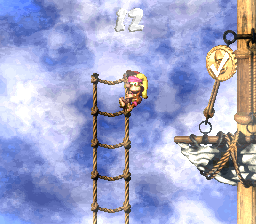 Mainbrace Mayhem is the second level of Donkey Kong Country 2: Diddy's Kong Quest and its world, Gangplank Galleon. This is the first rigging level of the game, and it involves Diddy and Dixie Kong climbing on multiple ship masts and yards in order to progress. The Kongs are introduced to two new enemies in this level. These enemies include Click-Clacks and Klingers, whom they constantly meet as they climb up the masts. The enemies that return in this level are Neeks and Klomps. The level begins on a yard with a Click-Clack and a few bananas on it. There is a tilted yard just ahead with a pair of Neeks and a barrel on it. A DK Barrel shakes in front of a nearby rope that leads up to a higher yard and the letter K. A Click-Clack is on this yard, and two more of these blue insects are on the following yard to the left. A crate also sits on the yard. Ropes are above here, and a Klinger slides along them, guarding a Banana Coin. The ropes can be used to reach a yard with another Click-Clack on it. A set of ropes floats near here with the letter O and another Klinger on it. Two yards are located around these ropes. The one on the left holds two Banana Coins, while the one to the right leads to some ropes. A Click-Clack is on this yard. Once the Kongs climb the ropes, they find themselves on a higher yard with a barrel. The Star Barrel is also above them here. Diddy Kong celebrates after completing the level. Neeks march down a tilted yard just ahead. Ropes are right after the mob of foes, holding a DK Barrel. 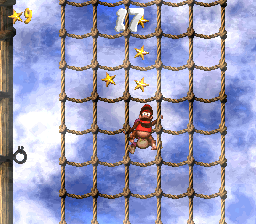 When the Kongs climb the rope, they can find a yard with two Klomps and a crate on it. They can either travel along this yard or continue along the rope, which leads above the Kremling enemies. Many bananas are along the long rope. At the end of the rope and the yard, the heroes can find two sets of ropes, both of which that are infested with Klingers. The letter N is next to the second set of ropes, which can be climbed to reach a yard with a Klomp, a DK Barrel, and a kannonball. There is a tilted yard nearby to the west, which has a pair a Click-Clacks marching along it. A flat yard is at the end of this one, which holds a cannon that can shoot the primates to a Bonus Level if the kannonball found previously is inserted into it. Some ropes with a Klinger on them are above here. 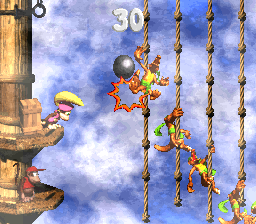 The Kongs can climb along the ropes to reach a second set of ropes with two Klingers on them. A yard is hidden to the left of here with a Bonus Barrel located above it. Soon, the heroes climb farther along the ropes, which lead straight to a yard with the End of Level Target on it. They must bounce on the target to complete the level. If they jump on it from the ropes, they can win in a prize from it. Banana There are 166 Bananas located throughout the level. To the right of the Warp Barrel. Behind the first Klinger of the level. Above the first Klinger of the level (GBA version only). 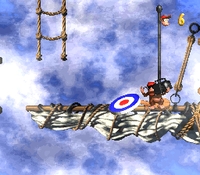 After the Letter O, the Kongs must climb down a rope that extends below the platform. To the left of the level's DK Coin. As an option on the End of Level Target's roulette. On the rope that leads to the letter K.
Shortly after a group of Neeks. Green: After the second DK Barrel, the Kongs will notice a single banana floating above a rope. Jumping into it will launch Diddy and Dixie to a higher platform with the balloon on it. On a platform with two Klomps. By the third DK Barrel. Cannon To the left of the two Click-Clacks that are found after the Kannonball. The first Bonus Level is near the very beginning of the level. Dixie Kong must be the Kong in the lead and look for a group of bananas forming the shape of an arrow to the right of the level's start. She must then use her Helicopter Spin to hover off of the yard and move through the air in the direction of the arrow, where she should see some ropes to climb on. To the right of the ropes is a Bonus Barrel, which she can go into in order to access a Bonus Level. There, Dixie and Diddy need to climb up a series of ropes until they reach the Kremkoin and complete the Bonus Level. They have 20 seconds to reach the coin located at the end of the bonus. The second Bonus Level can be reached by shooting out of a cannon. Shortly after passing the Star Barrel, the primates must find and pick up a kannonball and carry it across the yard. At the end of the yard, there is a cannon. When they put the ball in the cannon, it glows, meaning that it is loaded. The cannon can shoot them into the Bonus Level if they enter it in this state. In the Bonus Level, they must defeat some Klingers who slide on ropes above them within 35 seconds. The two primates must use the crates and kannonballs around them to defeat all of the enemies. Once they are all defeated, a Kremkoin appears to grab within the remaining time. The final Bonus Barrel is on a ship yard far west of the End of Level Target. The Kongs must use their Team-up move to reach the barrel. The barrel sends them into a Bonus Level, where they must climb up and down some ropes in order to collect 75 stars within the time limit of 35 seconds. Once all of the stars are collected, the Kremkoin appears for them to grab within the remaining time. On the first rope in the level. On the third set of ropes, by a Klinger. Next to the set of ropes just before the kannonball. At the bottom of the set of ropes that is located right next to the last Bonus Barrel. DK Coin This DK Coin is hidden above the level's exit. The Kongs need to use their Team-up move to reach it, as jumping cannot make them go high enough. Additionally, they can get the coin if they travel on the yard that is east of the third Bonus Barrel. Golden Feather (GBA version) To find the Golden Feather, the Kongs need to be on the group of ropes where the letter O is found. West of that letter icon, there is a hidden yard. The primates must jump on the yard to find two Banana Coins and a Golden Feather on it. At the beginning of the level, Dixie Kong should roll off of the edge of the first yard and then hover to the left under the yard with her Helicopter Spin to land in a hidden Warp Barrel that can take her into a Bonus Level. Here, she and Diddy Kong can find a formation of bananas that create an exclamation mark on a yard. If they travel to the right end of the bonus, they can exit the area and reenter the main level near the level's DK Coin, which is positioned above the End of Level Target. Italian Orde di Corde! Hordes of Ropes! The heroes climb in the level's third Bonus Level in the original version of the game. The Kongs run with a kannonball. The Kongs stand near a DK Coin. 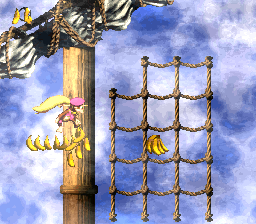 The Kongs climb ropes in the Game Boy Advance version of the game.